Welcome to our very first Conversations at the Coalface! In this episode, we talk to Dean Tavener, Head of Operations at Lifestyle Financial Services. Hear his point of view as the person having to deal with issues that come through integration post completion, in a company that uses acquisition as a growth strategy. 00:00 We Have A New Segment! We Have A New Segment! Joanna: Hi, it’s Joanna Oakey here and welcome back to The Deal Room Podcast! 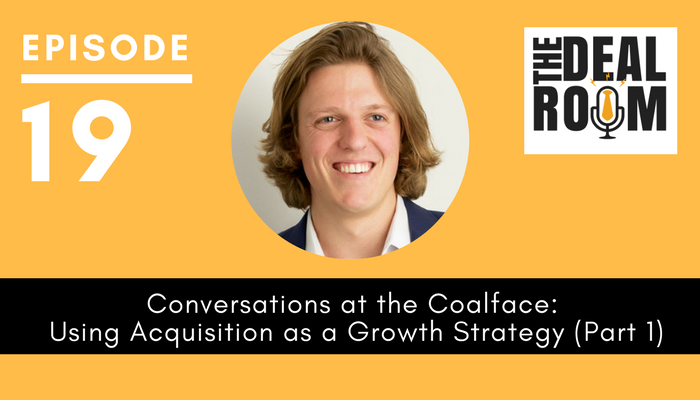 Today we have a bit of a different episode called “Conversations At The Coalface.” And so this is a segment where I’m going to be talking to people who are at the coalface within organisations that are buying or selling to get perspectives from the ground up. I think it’s really interesting sometimes to hear experiences from people who are involved from the business side of the process rather than just the advisor side. So today we are talking to a company at the coalface of using acquisition as a growth strategy. Joanna: We’re talking to Dean Tavener who’s the Head of Operations at Lifestyle Financial Services. He’s worked with the CEO of that financial planning business to grow the business from eight staff to 26 staff and to grow assets under management from around 450 million to now around about 1.78 billion dollars all in the last 18 months and this has been mostly through their acquisition focus. So it’s a good insight into organisations who are busily buying up businesses as part of their growth strategy and Dean is talking to us today about his role in integrating businesses post-completion. He also has a lot of interesting things to say about the targets and the strategy that’s behind it but I think it’s really interesting to hear his point of view from the coalface as the person who is having to deal with the issues that come through integration post completion. Hi Dean! Thanks for coming along to speak to us today. Dean: My pleasure. Happy to be here. Joanna: Great. Look this is a really interesting story you have of Lifestyle Financial Services’ rapid growth through acquisitions. There’s so many things that I would like to talk to you about. We’ll try and keep it short within that context as well. But how about we maybe start by walking through how you’ve been personally involved in these acquisitions so far? Dean: Okay, good question. So as the Head of Operations my main involvement with the acquisitions that we’ve gone through in the last 18 months or so (and there’s been about five of them) has been with basically the implementation, which I know can mean a lot of different things to different people. But I’m essentially talking about everything that needs to be done after the dotted line has been signed so to speak, to actually take on the assets that we’ve paid for and make it work and make sure that we see the return on the investment that we’ve made. Our acquisitions have been a combination of a couple of acquisitions where we’ve taken on board the whole company essentially – so the staff, the brand and so on. And there’s obviously a lot in that in terms of integrating their existing systems with our existing systems and trying to find the best match or what to drop and what to keep in that regard, as well as having the staff of the purchased business slot into our existing teams and learn to work the way that we do or for us to learn the way that they work. And then some simpler acquisitions where we’ve simply purchased the book of clients from the seller and left shares and staff and other sort of assets like that out of the question, which are a little bit easier to implement. But for anyone that’s worked in the financial services space, they would know that there’s still plenty of compliance hurdles to jump to have things or affected as best we can so that business can just continue operating without an impact on the customers and of course without an impact on revenue. Joanna: Okay. And I guess one thing I haven’t said so far and we should probably say right at the beginning. Here we’re talking about Lifestyle Financial Services being a financial planning business that is essentially going through the process now of buying financial planning firms as a growth strategy. Is that right? Is that a correct summation? Dean: Yeah, correct. So financial planning business, and we’ve been around for about 27 years and just in the last 18 months or so have really focused on growth through acquisition and trying to hit a certain scale especially in one department of our overall business plan. Joanna: And that then leads into what was going to be my next question, but which you’ve somewhat answered already. What’s the strategy behind all of these acquisitions? Why acquisitions rather than organic growth? What was the thinking there? Dean: Okay. There’s a big answer to that, but I’ll try and keep it relatively succinct. We’ve had a degree of organic growth for a long time. But we recently joined a larger group called the AZ NGA Group which has sort of come into this market in the last three to four years. This is part of their overall offering and why we joined up with them is that they provide some capital essentially where appropriate for the firms that join their group to be able to acquire. The reason that that’s been especially attractive to us as a growth strategy recently to supplement the sort of organic growth that has been going along nicely, but not with astronomical growth rates, is that there’s been a couple of significant industry and compliance shifts recently; legislative changes that have rocked the way that some businesses work. Essentially, people or some businesses are trying to offload a portion of their client base or even get out of the industry altogether as a result of those changes and the new requirements of the way things have to be done and the CEO here has basically seen that as a risk and an opportunity. We had the choice of either taking the same path and getting out of this space with the rules changed, but have gone for the other option there which has been to buy up where everyone is selling out and trying to get a scale that will make it effective to be able to continue to play in that area. Joanna: Alright, so I can see the strategy here. It’s all about fast growth to scale quickly in an area where you had to make a decision either to scale it or lose it basically. Dean: Yeah, that’s basically it. And we’re trying to implement and use technology in the smartest way that we can to help us scale more without having to bring on as much cost. So we’re trying to really increase our referral base and our client base. And we believe that we can continue offering the same sort of level of service to a much larger base of clients without necessarily having to up the costs at the same rate. Joanna: Okay. And you mentioned five acquisitions in the last, did you say in the last year? or the last 18 months? Dean: It’s been a bit over a year now. Joanna: A bit over a year. And then I think when we were discussing before you said that AZ NGA has completed 19 acquisitions itself and 53 secondary acquisitions. So is that right? Are those figures correct? Dean: I haven’t done a very precise double check on those. But I’d say that within one or two, that is correct. AZ NGA, which I can sort of refer to as our parent company in a way, that’s a slightly complicated company structure there. But if we consider them the parent of the group, AZ NGA has done around 19 direct acquisitions and about 52/53 acquisitions overall in the last three years approximately. Let’s take a short break. 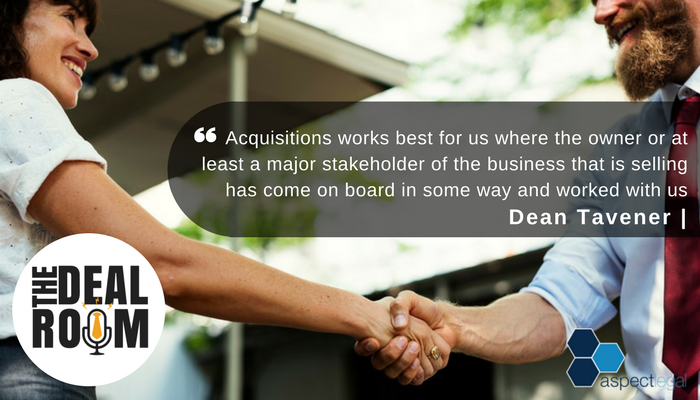 When we get back, Dean continues the conversation by telling us what they look for when seeking to acquire another firm. We’ll also have a look at this tricky concept of earn out agreements, and how Lifestyle Financial Services used it as an effective transition tool. And that’s next! This is Joanna Oakey, and you’ve been listening to The Deal Room – a podcast brought to you by Aspect Legal. 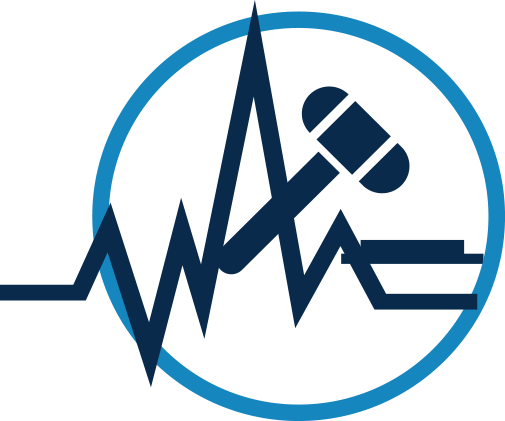 If you’re interested in hearing smart legal tips for business, The Deal Room’s sister podcast – Talking Law – is perfect for you! These two are now among the top legal podcasts in Australia! In our Talking Law podcast, I dissect a different topic each week that I have seen impact businesses, and I will then provide actionable tips for you to avoid that risk, or to use that legal area to your advantage. We release new episodes every 10 days. You can listen to our episodes on www.talkinglaw.com.au or subscribe to our Talking Law podcast on iTunes to be the first to know when a new episode is out. Now back to the show! Welcome back! Earlier, Dean talked to us about his role in integrating businesses post-completion. He also had a lot of interesting things to say about the strategy that’s behind their acquisition focus. Let’s jump back to the conversation and find out what they look for in a target. Dean: There’s a few things that we’d be looking for and a couple of them I’m sure will be taken as given by most of your listeners. Obviously, it has to be a profitable business. There has to be still potential for growth. So if we see that every revenue stream that sits within that kind of business or that kind of client base is being harvested (for want of a better word) and if that’s already the case then it’s potentially not as good a purchase as when we can come in and create more upside than those currently in the business. When looking at a more comprehensive acquisitions or where we bring on staff, the offices, the brand name and so on as well, then cultural fit is definitely very important. Possibly one of the top criterion that needs to be filled. Joanna: And what do you mean by that? When you talk about cultural fit, what particular cultural fit are you looking for in this target? Dean: The main two that come to mind are firstly a cultural fit for the staff, if we’re going to be bringing on the staff of the company that we’re acquiring. It’s very important to us and as to management and also to all the people that we work with that any new employees that are going to come on especially in bulk like that will be able to get along with the rest of the team and the rest of the business even if they will be sitting in their current offices and not necessarily sitting in the same space or integrating in the short term with our teams. There’s always going to be a degree of having to work together with the people that we’ve already got. So it’s very important that everyone can get along, have fun, be supportive of one another and then there’s not going to be any serious personality friction there. Joanna: How do you assess that? Is that a gut feel thing? Is that something where someone from your organisation goes in and has a chat to the staff and comes up with a feeling about it or is there a particularly structured approach that you work through? Dean: Unfortunately, it’s not particularly structured. I don’t think it would be as easy as applying a due diligence method on each of the members on the cultural side. It’s always going to be a little bit of a gut feel kind of assessment I think. We’ve definitely done it in the past at least once where there’s been a sort of interview process with each of the staff which gives us a little bit of a feel for who they are and how they work. And I think it also comes back to the feel for the overall culture of the organisation which is actually what I was going to add to before anyway. So the overall culture whether that’s coming from the top or from the bottom or both. But the idea of how the company treats its clients and its supplier’s attitude to doing business in terms of what kind of service or support they’re trying to offer, the level of quality essentially. I’m trying to talk in generic terms here so it’s pretty applicable to the majority of people listening. But I think that kind of a similar attitude to the way that you do business I think is really helpful to ensuring a smoother transition, a smoother acquisition and will feed down through to the staff as well. 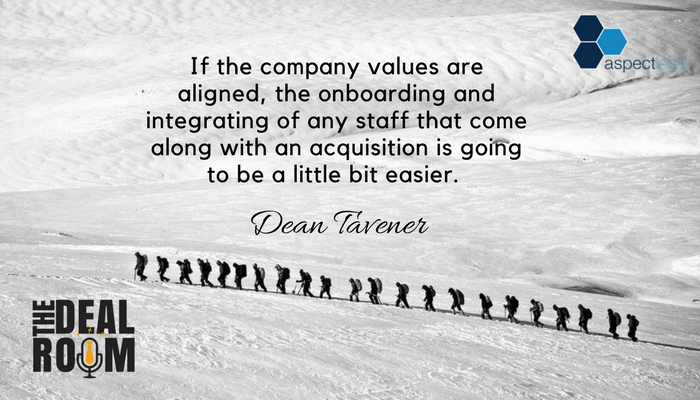 If the company values are aligned I think that the onboarding and integrating of any staff that come along with an acquisition is going to be a little bit easier because of that as well. Joanna: It makes complete sense. And once again when you’re looking at the overall culture, the way you’re assessing that is by going in and talking to the senior management and hearing how their attitude to clients and to doing business and those sorts of things? Or are there checklist that you’re working through or other sort of structured approaches that using? Dean: I’d say it’s been mostly through the conversational route. We don’t have a very structured approach to this but it comes out in the process of due diligence and working out the details of the deal. Obviously, the management of both companies have to work pretty closely together throughout that ordeal. So the values in the way that we all work comes out in that process to an extent anyway. Joanna: How many of your businesses that you’re acquiring do you have the business owners continue to stay on and work in the business moving forward. What component is selling to retire versus selling to continue? Dean: I can’t really answer the second part of that question just because it’s a bit of a blurred line. But the first part definitely I feel very strongly that the acquisitions work best for us where the owner or at least a major stakeholder of the business that is selling has come on board or come across in some way and worked with us or for us, however you would like to see it, for a while at least, to ensure there’s a smooth acquisition process and a smooth transition for the clients. Because in the end, if we make an acquisition of the business whose revenue is based on interaction with clients and the clients feel mishandled then there’s not going to be a lot of revenue left. So that’s been really crucial and there was one acquisition that we’ve made in the last 18 months where that didn’t happen to such a full extent. The owners of the selling business weren’t all that engaged with us. We kind of just took on the purchase and thought that we could do the on-boarding and transition phases ourselves. It all worked out okay in the end but it was definitely a lot more work and a lot more of a shaky experience for everyone involved. And so every other acquisition we’ve done, the owners have worked with us either through an employment contract or some kind of contracting or consulting arrangement but there’s definitely been a lot of co-operative work on the deal. Joanna: Yep, I see. And so do you now sort of work with a minimum period that you would expect and want the sellers to continue to be involved for now? Is this something now that you see that there is a minimum requirement of? Dean: Yeah. So we’re more or less settled on 12 months. It seems to be the minimum. I think it’s a very case to case basis. And these things can be very large and complex. So I’m sure there’s arguments for being more or less in certain circumstances. But we’ve found that firstly structuring the deal in a way that has an upside payment or a second payment determined by the progress of the profitability over the first 12 months and both parties having vested interest in maintaining certain profitability over that time, having that payment set for 12 months later then creates a really good set of goalposts for all parties to work towards together for 12 months and that’s a very decent amount of time to enable a smooth transition and to iron out any bugs in the process and just jump through the compliance hoops that need to be jumped through along the way as well. Joanna: Yeah. And look it’s really interesting that you’re talking about this because this concept of paying vendors later on, so earn outs effectively, where you’re paying them on the basis of performance or whatever at a point post transaction can be a point of contention often. And particularly, I often find when accountants are advising their clients and sometimes lawyers they can be a little bit wary of the concept of earn outs because unfortunately as advisors in this space can sometimes see issues that are caused by earn outs if vendors are relying on them and then something happens outside of their control into the future and then they can’t. There’s issues calling on the payment of the earn out. But it sounds like in your instance earn outs are really helping to make this transition work effectively for both parties I guess. Dean: Yeah, I think they’ve been a good feature to the overall process on the whole. That’s not to say that we’ve used them the same way every time, had the same terms or the same length of period over which it’s all assessed. I think as I said every case needs to be assessed on its own merits. There’s so many moving parts but on the whole I think it’s a good feature to encourage cooperation and working together to make sure the deal is a win win which is really what everyone’s after in the end. So it helps align that goal. Joanna: Excellent. I really like to hear positive feedback in relation to some of these more contentious issues like for example the concept of earn outs and how they actually are working in practice for everyone. So it’s great to hear that in your situation they’re working well. Indeed you’re the buyer so usually they’re the party sometimes that may have the most to benefit from them, except for the fact that obviously these parties that you’re buying from are getting an upside themselves in getting these payments from the earn out payments and obviously you’re in the place now where you’ve seen some of these earn out payments actually being made to those sellers, is that right? You’ve seen some of these transactions now where some of this earn out cash has changed hands. Joanna: And I’m sure that leads to happiness on the side of the vendor as well, right? Dean: Yeah, it does. We believe so from the extent that we communicate with them. So it seems like a win win in most situations, just not all. But if done well I think it can be really beneficial. That’s a wrap for part one of this two-part series with Dean Tavener of Lifestyle Financial Services. In part two, Dean gets down into the weeds about the other things that they look for in a target acquisition. It’s also interesting to hear his point of view from the coalface as the person who deals with the issues that come through integration post completion. f you would like more information about this topic, head over to our website where you can find a transcript of this podcast episode and details on how to contact Dean Tavener directly. So head over to our website at thedealroompodcast.com and there you’ll also find details of how to contact our lawyers at Aspect Legal if you or your clients would like to discuss any legal aspects of sales or acquisitions. We’ve got a number of great services that help businesses prepare for a sale or acquisition or help them through the transaction process. We work with clients both big and small so don’t hesitate to book an appointment if you’d like to find out how we may be able to assist. Finally, if you enjoyed what you heard today please pop over to iTunes and leave us a review. I’d be ever so grateful. And if you have any topics that you would like us to cover on this podcast, please shoot me an email.Thanks again for listening in. You have been listening to Joanna Oakey and the Deal Room Podcast sponsored by Aspect Legal. See you next time!